A 37-car train derailment on Saturday afternoon. At least one of the cars was carrying a hazardous material. Inhaling the component could be deadly. 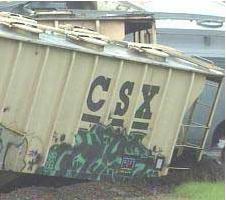 Train Derails, Dumps Military Tanks [Sep 5] http://www.wlbt.com/Global/story.asp? A Kansas City Southern train carrying military fighting vehicles derailed Sunday. Twenty-two train cars derailed just after 2:00 Sunday afternoon. Their cargo was M-1 A-1 Abrams Tanks and Bradley Fighting vehicles. Officials are still trying to determine the cause of the accident. Authorities say a CSX freight train derailed at a connection track. an engineer noticed his train was switched onto the wrong track. When he hit the emergency brake, twenty-two cars derailed. On the news today [Sep 7], a huge 20 deep sinkhole opened in Joplin, Mo. A man's patio sunk while he was having a barbeque yesterday! He barely survived.